At the end of 1980 Jack Lynch and Mary Wheeler moved the wolves from Gardiner, Washington to Emigrant, Montana, a small community bordering the Gallatin Range and near the towns of Livingston and Bozeman. The new wolf park was located about 25 miles north of Yellowstone National Park. Soon after the move to Montana, Jack and Mary got married217 and Mary Wheeler changed her name to Mary Lynch. Until the late 1980s, the Lynches and their wolves appeared semi-frequently in newspaper and magazine articles. By around 1990 media coverage of the Foundation had mostly ceased. By the early 1990s the reintroduction of wolves to Yellowstone National Park had become a serious consideration. Because the Lynches lived so close to the park, they and their wolves occasionally became a part of the conversation. The Lynches were staunchly opposed to the proposed reintroduction of wolves to Yellowstone National Park. Back in 1976 when Dr. Durward Allen had proposed a Great Plains National Park which could potentially include Lynch's wolves,254 Jack had supported such a plan because the proposed park would have been fenced off, offering the wolves protection and avoiding confrontation with the ranching community. The Yellowstone reintroduction plan assumed that the wolves would stay in the park without fences, a notion with which Jack disagreed. 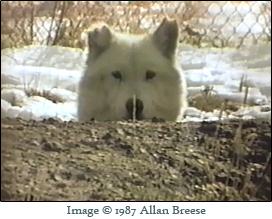 In 1995, wolves were reintroduced to Yellowstone National Park. Jack Lynch passed away on July 26, 2006 at the age of 82.1 Two years later in 2008, Mary Lynch and her son Edward Wheeler moved the wolves to a new, larger location in Bridger, Montana. 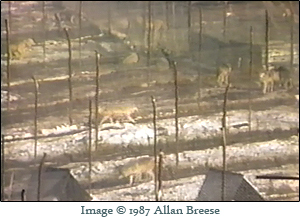 2Sources: http://www.forwolves.org/ralph/wpages/yell-o.htm#Leopold%20Pack%201996-98 and http://www.thewildlifenews.com/wolf-reintroduction-history/. I would like to confirm the date. Find out more about the Emigrant park by exploring the Locations - Emigrant, MT tag in the archive.